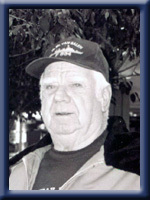 Goulden, Everett Joseph “Boathouse”, of Liverpool, Queens County, passed away on Thursday, November 24th, 2011, in Queens General Hospital, Liverpool. Born in Liverpool, he was a son of the late Everett Joseph Sr. and Nellie Mae (White) Goulden. Boathouse was employed at the Bowater Mersey Paper Mill for over 25 years. He was a former member of the Liverpool Volunteer Fire Department, Liverpool Golf and Country Club and the Senior B Cubs Softball Team. Boathouse loved hunting, going to yard sales, and doing card tricks for his grandchildren. He enjoyed spending time at his cabin, music on the hill and jamming with his friends. He was affectionately known by his friends as being a bit of a pool shark. He is survived by his loving wife, Freda (Moss); daughters Leslie (Alan) Robart, Heather (Paddy) Kelly, Kelly (Andrew) Maule; son Shane (Shelley); all of Liverpool; grandchildren Ami-Lynn (Tony), Simeon (Holly), Rachel (Brandon), Rebecca, Jack, Micheal. He was predeceased by sisters Margaret, Joyce, Betty; brothers William and Frank. To the Goulden family.I offer my sincere condolences.I worked with Boathouse for a number of years and have some great memories.I met Boathouse just a few days ago and talked to him about the good times we had at the mill.Keep his memory true to your hearts and may he rest in pease. Robert and I were so sorry to hear of Boathouse’s death. Our thoughts and prayers are with you at this most difficult time. Please accept my sincere sympathy at your sad loss. I know how difficult it is to say “goodby”. Try to remember the good times, it really does help. So sorry to hear of Boathouse’s passing, our prayers & thought are with you at this difficult time. We are so sorry for your loss. Thinking of all of you at this very sad time. I am very sorry to read about your husband and Dad’s passing; our thoughts and prayers are will you all at this most difficult time. Shelly, Shane and Family. Sorry for your loss, Our sincere sympathy to the family. Thinking of you all. Goulden Family: We were so sorry to hear about the passing of Boathouse. Lots of great memories from the days of minor hockey and minor baseball. Our thoughts and prayers are with your family at this difficult. time. We were so sorry to hear of Boaty’s passing. at the Mill. Take comfort in each other and your families. Freda & family….So sorry to hear of Boatie’s passing. We’ll all remember the sing songs we had on the “hill”. There are so many wonderful memories. Keep those memories with you always. You’re all in our thoughts and prayers. Billie, Florence, Sybil, Bonnie & Susan. So sorry to read of your husband and father’s passing.May God grant you the strength to carry on knowing that “Boatie” is in His hands. Freda & Family so sorry for your loss .Thinking of you at this sad time. To Freda and Family……so sorry to hear of Boats passing…Our thoughts are with you in your time of sorrow.God Bless you all. Was so saddened to hear about Boathouse. Please except my sympthy Freda and Family. I want to express my deepest sympathy to all of you during this sad time. Boathouse was well-known and well-liked by so many and his presence will be missed around town. I always enjoyed seeing him and his old car pulling into Leslie and Allan’s. May you all find strength in the days to come to get you through the sad times. We’re so sorry for your loss. So sorry to see that Boathouse has passed away . Harry always enjoyed jokes with him fishing . Our prayers are with the family in this sad time. Heather, so sorry to hear about your Dad. I know what you are going through. Think of the good times you had with him. They DO help. Freda and Family: So sorry to hear about Boatie’s passing. My thoughts and prayers are with you all at this most difficult and sad time. Freda and family, so sorry to hear about Boatie,,he and Duff are together now probably playing and singing, that is how i like to think of them., they were such good friends. We are so sorry to hear of Boatie’s Passing. Alway’s remember the good times you all had together this will help ease the pain. Our prayer’s and thoughts will be with you. May God be with you all. So sorry to hear of your dad’s passing. My prayers are with you and your family at this time. Our sympathy, boatie will be missed by many, love surrounds you at this time. We were so very shocked and saddened to hear of your Dad’s passing! Our thoughts and prayers are with you in this very difficult time. To the Goulden,you are in my thoughts & prayers.Maybe Boathouse & my Dad are sitting back sharing a few stories & a couple of drinks. That would be nice. Heaven must’ve needed another angel.Thinking of you all. Our Deepest Sympathy to you all. Be strong for one another and remember all the happy times. Our thoughts and prayers are with you at this difficult time. I remember many years ago when Lanny and Boaty worked together at the mill……always a story to tell and a laugh. He will be missed by all who knew him. WITH MY HEARTFELT SYMPATHY TOO THE FAMILY. So sorry to here of the passing of boatie are thoughts and prayers are with the family at this time. We are sorry for your loss. Our thoughts and prayers are with all of you at this very sad time. All our thoughts and prayers are with you at this very difficult time. Boaty was a man of distinct character and will never be forgotten by anyone who knew him. All our love to the family. We were so sorry to hear of this. Our thoughts and prayers are with you all. My sincere condolences to Boatie’s family. You will not know me but I knew Boatie back in the 1950’s. Since then I’ve been all over Canada and living in Ontario for the past 40 plus years but this will tell you what a special guy he was – I still remember him so well, his wonderful sense of humour and “joy of life” and all the laughs and fun. He was a great dancer! I know this must be a very difficult time for all of you – remember all the good times and treasure them as I know Boaie did. God bless you all. We are sorry to hear about Boathouse.Gary has spoke of him fondly.I know Gary and Dave went to visit him about two summers ago.Gary is planning to come up on Sunday. Freda and all your family, we are so sorry to hear of Boatie’s passing.I am, so glad we got to all be together at Ami’s wedding this summer for alot of laughs and stories.love and hugs to you all. Dear Freda&family. We were so sad to hear of Boatie’s passing. He&I went back a good many years in our friendship, when we were young and travelled around with the late murry norman. I enjoyed his phone calls &visits the past few years, when he was able to make it.Remember he is with you always and GOD bless you all. Bobby&yvonne young. To Leslie and Family..We are very sorry in hearing of you fathers passing.Our prayers are with you and family. We were so sorry to hear about the passing of your dad. Our thoughts and prayers are with you in this time of sadness. so sorry to hear about your dad. If you need anything just ask. Dear Freda and family: We were saddened to read of Boathouse’s passing. His smile and the twinkle in his eye will always be remembered. Our prayers are with you all at this time. we are so sorry to hear about Boaty’s passing. We sure have lots of good memories from over the years. Please accept our sincere sympathy, and know that you are in our prayers. So sorry to hear of Boatie’s passing. Deepest Sympathy to you all. We will keep you all in our thoughts and prayers. My condolences to you all. Sending lots of love and hugs down your way. Take care. So very sorry for your loss. Boatie was a genuine nice man, one that I’ve always respected. So sorry to hear of Boatie’s passing. My memory of him is that always smiling face and the many hours spent at the arena. Take care. Al, Leslie and Family…so sorry to hear of your Dad’s passing…thinking of you all during this very difficult time…hugs! Leslie, Alan and familes – So sorry to hear of your dad’s passing. As we both know, familes and friends will help you through it. Remember the good times – which we both had. Hugs to you in this difficult time but they say it will get easier. Freda and family, our thoughts and prayers are with you. So sorry to hear of your dad’s passing. You’re in our prayers. Very sad to hear of Boaty’s passing. He was surely a great guy and I am blessed to have known him. Will certainly always cherrish fond memories of our Jams together, and of course the friendly convertible wave on the Beech Hill Rd. My sincere condolences to Freda & Boatie’s family. shocked to hear of his passing , had some good times at your place a lot of laughs & stories between him & Duff . My thoughts and prayers are with you at this very difficult time. Wishing you my heartfelt condolences for the loss of your Dad. We were so saddened for your loss. Our prayers and thoughts are with you at this difficult time. God bless you all.